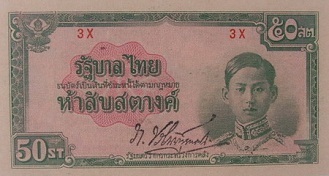 Plain note without serial number nor signature UNC about 16,500 - 17,500 baht. Ordinary number signature Pao UNC about 1,650 - 1,740 baht. Ordinary number signature Pao EF about 1,200 - 1,260 baht. Ordinary number signature Leng UNC about 1,500 - 1,600 baht. 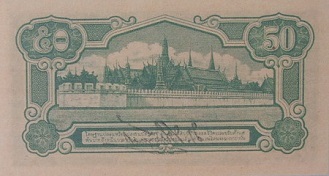 The 5th series 50 Satang banknotes were announced on 16th April 1942. The main object is the image of King Rama 8 on the right. The middle is the "Thai Government" on guilloche design. The serial code and number were printed with red ink. There is no watermark. The main object is the Emeral Temple at the Grand Palace.